When it snows, warm up with New Planet Beer. Here’s a fun drink otherwise known as Real Pirates Grog that will thaw out your insides. Arrrrrrr!! Cook the oatmeal using beer instead of boiling water and stir in other ingredients. Learn how to make more fun beer drinks at barnonedrinks.com. New Planet enjoyed a prime spot in the shade right in front of the stage! New Planet Beer was requested by String Cheese Incident’s Kyle Hollingsworth for Kyle’s 2011 Brew Fest! We were able to provide gluten-free beer to those who would not otherwise have had the ability to enjoy a refreshing beer at a brew fest. Both gluten-free and non-gluten-free consumers all enjoyed the light refreshing taste of Tread Lightly Ale, 3R Raspberry Ale and Off Grid Pale Ale. By the end of the day everyone’s thirst was quenched on a particularly hot day. The live music, wonderful beer, food and great fans made the event a success. New Planet Beer looks forward to being represented at Kyle’s beer festival in the future! As the day continued on, Kyle, the keyboardist for String Cheese Incident, came by the booth to enjoy some New Planet Beer! New Planet enthusiasts were extremely excited to see the beer represented at a Beer Festival. They could finally drink and enjoy! Home to more than 200 rotating taps, Falling Rock Taphouse is a beer giant in Denver. While the taps are ever-changing, you can always get a cold gluten-free Tread Lightly Ale at Falling Rock. The Taphouse features a large outdoor patio with ample seating for sunny days as well as a fleet of pool tables and dart boards in the basement. Upon entering the Falling Rock Taphouse, you’ll immediately notice the 2200+ beer bottles lining the walls. These bottles are, in fact, the personal collection of the manager, Chris. New Planet Beer is proud to be served at the Falling Rock Taphouse, with its vast collection of beers and clear taste for quality. The Taphouse is located at 1919 Blake Street. Uptown Brothers Brewing Company provides a casual sports bar experience on Capitol Hill and boasts a large beer menu of 32 taps and 61 bottles. With 19 47” HDTVs on location, you’re sure to have a good view of the important sporting events of the day. If sports games aren’t your thing, Uptown Brothers boasts Tuesday Two-fer Trivia nights and the occasional local band on weekends. Uptown Brothers Brewing Company proudly serves cold bottles of Tread Lightly Ale and offers sensational late-night happy hour specials, including $2.00 well-drinks and domestic beers. Uptown Brothers Brewing Company is located at 320 E. Colfax Avenue. A sibling of Boulder’s eclectic Mountain Sun Pub and Southern Sun Pub, the Vine Street Pub offers all of the same bohemian charm and delicious beer that patrons of the Boulder locations have come to love. Enjoy a gluten-free Tread Lightly Ale on their sunny patio or duck inside for some friendly conversation at the bar. Loyal fans have awarded the Pub a solid four stars on Yelp.com. The Vine Street Pub features an array of entertainment from live music to comedy on Sundays. The Vine Street Pub is located near City Park at 1700 Vine Street. Turn your gluten-free beer green for Saint Patrick’s Day. 1. Find a store near you that carries New Planet Beer. 4. Pour Tread Lightly Ale into a pint glass or beer mug. 6. Cheers to the Saint Patrick’s Day and that you can enjoy the fun holiday with a great tasting gluten-free beer. With over 3 million people in the U.S. diagnosed with Celiac disease, restaurants and other establishments are changing their menus to accommodate their gluten-free clientele. Many stadiums across the country have begun to offer gluten-free options, from gluten-free hotdog and hamburger buns to cookies and beer! Unfortunately, for those of you headed to Dallas for Super Bowl weekend will have to bring your own game day snacks, the new stadium doesn’t have gluten-free options. However, according to the website, they do permit people with “medical requirements and special needs” who can call ahead to bring in food and beverages. If you are planning on attending the game and want to bring in some gluten-free snacks, or some New Planet Beer, give the Cowboys Stadium Guest Services a call at (817) 892-4161. For those of you watching the game from home or at a friends house, pick up some New Planet Beer at your local Colorado liquor store. Here is a recipe to go along with your New Planet Beer. Method: Heat 1 teaspoon olive oil in a medium sized saute pan over medium heat. Add red peppers, corn, and black beans. Season with cumin, salt and pepper, cook for 3 to 5 minutes. After a long day of skiing there are few things that sound more delicious and rewarding than a nice juicy burger and an ice-cold beer. For those of us that are gluten-free, eating on the mountain can be a rather arduous task. Some mountains are expanding their menu with more gluten free options. At Two Elk Lodge on Vail Mountain, they have labeled all gluten-free options and even have gluten-free brownies! We have compiled a list of gluten-free friendly ski snacks to help those out who don’t want to stop ripping the pow just to have a bite to eat. These snacks are easy to pack and can easily be eaten on the chair. Take your pick, from honey peanut butter, to maple almond butter, or even chocolate hazelnut butter, Justins has you covered while on the slopes. All flavors come in jars, and most come in convenient squeeze packs that fit perfectly in a pocket. Pair with an apple, celery, or some crackers and you have a protein packed snack. Make sure to kneed the squeeze pack first, as they can become very cold while skiing. Larabars are a great source of energy and protein packed into a wonderful little bar. There are tons of flavors, and they are made from fresh and natural ingredients. Pick them up at your local health food store. A great little pick-me-up and easy to make. Take a gluten-free corn tortilla throw down your favorite condiments, hummus, turkey, avocado and roll it up. They are simple to put together and delicious. They are easy to put in a pocket as well, although they tend to crush easier upon impact. Maybe not the easiest to pack in your ski coat, but if you are skiing in Colorado there’s a good chance that the ski lodge offers New Planet Beer. To be sure, check out our Beer Locator. Type in the zip code of the ski resort and see if the lodge shows up in the list. What’s your favorite Gluten-Free ski snack? Have you found any Gluten-Free friendly on-mountain restaurants? Tell us! New Planet Beer fans are a pivotal component of our marketing scheme. Word of mouth is our greatest advertising tool to spread the word about New Planet Beer and increase public awareness of gluten sensitivity and celiac disease. We know, and want to acknowledge, the role that word of mouth has played in the success of New Planet Beer. Send us a photo of where you have taken New Planet Beer. We want to see how far our beer travels, the bluest seas, the highest mountains, and the snowiest of ski slopes. Or, take our beer to the University of Miami’s football game like Kiah Barrette did. Your pictures will be featured on the New Planet Beer website and facebook. Each month we’ll draw a lucky traveler to win free New Planet Beer! Help us continue to spread the word about our beers! https://www.newplanetbeer.com/wp-content/uploads/2011/01/Picture-1.png 574 427 GFBeer https://www.newplanetbeer.com/wp-content/uploads/2016/01/mobile-logo.png GFBeer2011-01-12 09:14:312011-01-12 09:29:30Where in the world is NPB? New Planet Beer attended the world’s first International Beer Bloggers & Online Media Conference that took place November 5-7, 2010 in Boulder, Colorado. Beer bloggers, industry bloggers, and other beer and social media professionals gathered from throughout North America and beyond to meet, learn, and share. What a fun event! Beer bloggers shared topics ranging from blogging best practices to beer and food pairings. Another hot topic was how to better connect women and beer, which turned out to be a heated conversation…but in the end, it turned out to be an extra reason to raise the glass, so everyone was happy. The most exciting event at the conference was called Live Beer Blogging, in which New Planet Beer participated. It was kind of like speed dating, but with a lot of beer. Bloggers were seated at 12 round tables of 8-10 people per table, who were armed with computers with a constant connection to their blog, facebook and twitter accounts. We had five minutes per table to pour a sample, educate them about our beer, our company, and field questions. At the end of each time slot, a bell would sound and we’d run to the next table. After 60 minutes of the New Planet Beer pitch, voices were lost, but we had a wonderful time connecting with these beer connoisseurs. 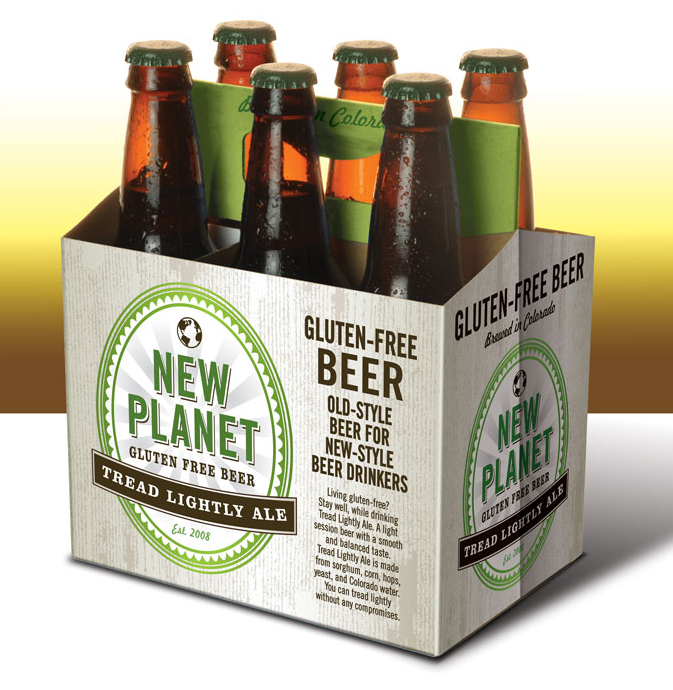 New Planet Beer was the only gluten-free beer represented as both Tread Lightly Ale and 3R Raspberry Ale were sampled. With a heavy gluten friendly audience, our gluten-free beer fared well. Here is a snap shot of what was said about New Planet Beer. sodakbeer: #BBC10 @newplanetbeer Raspberry Ale – raspberry aroma/taste – gluten free – light bodied – easy drinker! iBT_Jake: Oh , hello gluten free beer, nice to meet you. 3R Rasberry Ale and Tread Lightly Ale from @newplanetbeer. Very cool what they’re doing. billybroas: Impressed with my first gluten free beers from @newplanetbeer. It’s made from sorghum. Thanks to all the beer bloggers for such a great event!